To start off with, I just wanted to thank you for your order of the Level 8 Medallion. When I started this project, I never dreamed it would exceed my expectations the way it has. 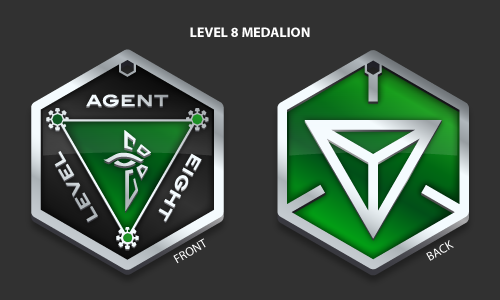 My first intention was to have something to give fellow Agents that I had helped reach their goal of “Level 8” as a real life Accomplishment Badge. I needed to purchase 250 to get them produced, I could only afford 150, so I shared my idea with my local friends and Agents. A few re-shares later, I’m getting interest from all around the globe. I gave the project a little over a week. In that time, The Enlightenment Community showed support to the tune of 1050 Medallions in 27 States and 13 countries. As for the order, with the unexpected popularity of the Medallion I wanted to make sure everyone was happy. The Medallions started production yesterday and will be in my hands on or before March 27th. It is my goal to have them in the mail with in two days. I expect to have a few extras will begin sales on the website as soon a I work a few things out. I also went ahead and paid to have a keychain attachment put on the Medallion. It can be easily removed if you don’t want it there. Making a profit was never part of the plan, and the experience of having an idea grow to this had made it all worth the effort. Again thank you for all your support, please continue to watch my webpage for future projects. I will make any updates to this project here. We are at the final stage of the manufacturing process. There has been a few small tweaks in the process to ensure quailty for everyone. The above picture is from the last batch of prototypes. There were some minor tweaks made after this, but I was excited to show you what they are looking like.A couple other minor quailty checks and we’re ready to go! I’m still expecting to have them in my posession and packaged to hit the mail to you next week. I will update you when they arive ready to be packaged and shipped.